The little Volkswagen sits on my bench and teases me with possibilities. Part of the art of making art is determining what is to be done. I gain a lot of please during the “what if” process. At this time I am thinking a man driving and a dog as his passenger…feet on the dash, ears flapping in the wind. And as the automata is cranked a background of changing scenery will scroll by. Right now I am actively (with my hands) developing Big Wheel Lift #1. At some point in the next month or two I’ll be able to stop dreaming at this little Volkswagen and will be able to begin free building. 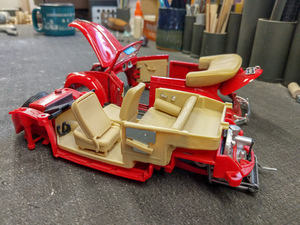 As I worked on other projects I would open the cabinet door and get a glimpse of the little red car and would spend some time thinking about how I wanted to approach the project. One of my big questions was ‘what is this thing made of? What am I going to have to do to modify it?’. So, it’s now officially on my bench and under construction. Turns out it is pretty easy to disassemble. Sort of like an auto factory, I guess. The body sits down on top of the chassis with all it’s details. The body is pretty much all die cast, and the chassis is primarily plastic. I’ve removed it’s ability to steer, and I’ve removed the front seats and the steering wheel. Replacement seats and steering wheel will be part of what I create. Now I need to determine the basic character of this automata. How many people? I think two? What will they be doing? I think ‘looking around’. The wheels will turn. The car will bounce. There will be scenery flowing by. This is a one off…I’m guessing I’ll be done with this in about a year. Perhaps sooner. I spotted a 1/16 scale Volkswagen Convertible on eBay and bought it. After I received and unboxed it I was impressed. Die Cast, but with some plastic…opening doors, trunk, engine compartment. It steered and had suspension. 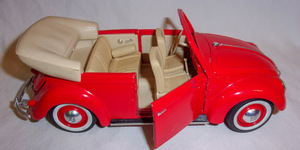 My vision for this little convertible is a couple out for a Sunday drive. I put the little car on a shelf in my studio and began to think about it. “A Sunday Drive” as received from eBay.